What’s the Matter With Islam? I really, really want to believe that. I’m predisposed to respect and think the best of others. I want to believe that we are all fellow seekers, and that Islam itself is not to blame for the atrocities perpetrated in its name. Have the Princes of Saudi Arabia, the mullahs of Iran, the imams of Cairo, Baghdad, and London, the various Palestinian factions condemned the carnage? Did I miss it? My headline is a takeoff on Thomas Frank’s book What’s the Matter with Kansas? The book title is at least a little bit tongue in cheek — Mr. Frank professes to be puzzled as to how any working-class person could ever possibly be a Republican, but I doubt he actually thinks it’s the fault of Kansas any more than, say, Oklahoma. But I really want to know: What’s the matter with Islam? 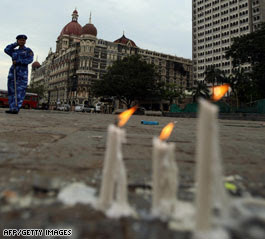 It’s not yet clear which group is behind the disciplined, well-coordinated attacks in Mumbai, but as Neo-neocon said, “it seems to involve Islamic terrorists. That’s always a good bet, of course.” Exactly right: not a certainty, but a good bet. The obvious counter-example is Oklahoma City, but whatever demons tormented Timothy McVeigh, those same demons do not seem to afflict a vast swath of humanity. There are more than a billion Muslims in the world, and the overwhelming majority are not terrorists. But now the law of large numbers rears its ugly head. If the potential “hijackers of a great religion” constitute only one-hundredth of one percent of all Muslims — 0.01% — that indicates more than 100,000 potential Islamic terrorists around the world. 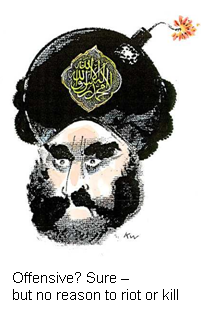 And given the widespread availability of (pro-) Osama bin Ladin T-shirts, the famous footage of Palestinians dancing in the streets after the Twin Towers fell, the riots around the world sparked by a few cartoons (like the one above) in a Danish newspaper, the Pakistani madrassas churning out new generations of jihadis, and the periodic recurrence of gleeful chants of “Death to America” by huge mobs of people in Iran, Lebanon, Pakistan, Saudi Arabia, Gaza and elsewhere… given all that, how confident do you feel that 0.01% is too high an estimate of the problem? It’s missing the point to get into debates about whether this is the “Deccan Mujahideen” or the ISI or al-Qaeda or Lashkar-e-Taiba. That’s a reductive argument. It could be all or none of them. The ideology has been so successfully seeded around the world that nobody needs a memo from corporate HQ to act: There are so many of these subgroups and individuals that they intersect across the planet in a million different ways. … Islamic imperialists want an Islamic society, not just in Palestine and Kashmir but in the Netherlands and Britain, too. Their chances of getting it will be determined by the ideology’s advance among the general Muslim population, and the general Muslim population’s demographic advance among everybody else. Obviously many evil acts have been committed over the years by people who called themselves Christians. But in recent centuries there has been no organized mass movement to commit violent mayhem in the name of Christ — and any such movement would be denounced by responsible Christians everywhere. If the 19 men who hijacked those jets on that sunny Tuesday morning had been Episcopalians, Christian leaders from the Pope and the Archbishop of Canterbury to the local parish priest would have strongly condemned the act. Does the problem with Islam lie in the religion or in the culture? Do the various pathologies found in large parts of the Islamic world — from terrorism and murder of innocents to female “circumcision” and the oppression of women — have a basis in the Qu’ran, or do they come from the Arab culture into which Islam was born? The distinction between religion and culture is valid, but only to a point. There is a huge overlap between the two — and the culture bears responsibility for the current practice of the religion. There are some reprehensible passages in the Bible, but over the centuries most Christians have come to reject them. Christians stopped sanctioning the killing of non-believers because Christianity as a culture came to know that it was wrong, despite whatever Biblical support might be found. Christians in America cited Biblical support for slavery, and other Christians led the way in renouncing it, first through the abolition movement and later through the civil rights movement. In the same way, Muslims bear the primary responsibility (not “blame”) for purging Islam of the evil done in its name. Perhaps Islam has been hijacked, as President Bush would have it. But if there is any broad-based, organized effort by moderate Muslims to overpower the “hijackers,” it has escaped my notice. I want to make very clear what I am not saying here. I am not saying Muslims are inherently evil. I am not saying there are no good Muslims, or that Islam has nothing positive to offer humanity. I most certainly am not condoning random violence or discrimination against Muslims. Every individual Muslim on the planet is a child of God and a sinner, traits they share with me. I am eager to treat them as brothers and sisters if they will do the same. What I am saying, and the reason I express these sentiments with some passion, is that it is dangerous to ignore the elephant in the room. We must stop hiding behind euphemisms like the “war on terror.” “Terror” is not the enemy, any more than V-1 bombs were the enemy in World War II. Terror is a weapon, and it’s being wielded against America and against civilization by theocrats and fascists who fly the flag of Islam. If we refuse to use the term Islamic terrorist, we conveniently take away any onus of responsibility for Islamic groups to halt the murderous ideology they propagate. In fact, in nearly EVERY claim of responsibility, which I studied, for hundreds of violent Islamic attacks which took place since 9/11, the common justification by the Muslim terrorist perpetrator was that there was a “war against Muslims” by the West and the Jews that had to be avenged. The real truth is that there is war against the West and the Jews by Islamic jihadists. And no amount of territorial withdrawal or peace negotiations will assuage them. Islam as a religion may not be the root cause of the problem. But Islam as a culture has a lot to answer for, and more of those billion Muslims need to step up. The Muslims advocating peaceful coexistence need to be seen as outnumbering the rioters and chanters in the streets. Only Muslims can make that happen. Now would be a good time to start. * Note: in a subsequent post, in response to a commenter on this post, I acknowledge that condemnation by Muslims of terrorism is somewhat more common than I give credit for above. This entry was posted in Uncategorized and tagged Bush, Evil, Islamic Fascism by Kirk Petersen. Bookmark the permalink. Kirk, you even admit that you are basing your argument on what you do not know, rather than on what you do know. You openly confess that you are not aware of Muslims condemning the violence by radicals. Yet such condemnations are easily found in three minutes via Google. I can direct you to scores of such condemnations translated into English. Many, many more are available in Arabic, Urdu, Pashtun and other languages. The fact that you are not even aware of this is case-closing evidence that your conclusions lack substance. How did it escape your notice that the government of Egypt, the world’s largest Arab country, has outlawed the Brotherhood of Islam and has even gone as far as jailing a popular political rival to Mubarak who happens to have the Brotherhood’s backing? Indonesia, the world’s largest Muslim-majority nation, is fighting tooth and nail against the radicals via the court system, the policy, the military and the political system. Pakistan earlier this year replaced its president, who had a lifelong record of opposing radical Islam, with a leader even more opposed the radicals and with fewer ties to elements in the nation’s security service who do support the radicals. The entire nation is in a day-to-day battle against the extremist minority. How have you missed this? What do you read? Where are you getting your views? Afghanistan is now in the process of destroying the religious radicals in its midst. I have to admit I’m shocked that your simply not aware of these actions, even though your very own tax dollars are involved and your countrymen are putting their lives on the line for it. The same goes for Iraq. While the country has become somewhat of a haven for terrorists after the U.S. invasion, it’s leadership is fighting day by day with all means available to destroy the Islamic radicals. The country does have much closer ties with Iran now than before the invasion, but that is not necessarily a proxy for radical Islam. Your own country is helping Iraqis fight this war too and you claim that you’re not aware of it? Syria famously slaughtered tens of thousands of Muslim radicals who had fomented an uprising against Bashir Assad’s father. The Assad regime still aggressively suppresses radical Islamists, which should be no surprise, as they pose the clearest and most present danger to the regime’s survival. Why are you not aware of this? Iraq famously, brutally suppressed Shia and Sunni religious radicals during the Saddam regime, as they were the clearest threat to his survival. India, Yemen, Morocco, Algeria: all have aggressive or even ruthless campaigns aimed at destroying Muslim radical movements. In fact there are really only three small countries that support Islamic radicalism, and one, is really more of a collection of tribes than a state: Somalia, Sudan and Iran. McDaddyo, thank you for a thoughtful response. However, the fact that a country will oppose radicals who are threatening to that country is a given, and does not address my point. I do note some support for your point of view, in that CAIR, which has been criticized for years as virtually an apologist for terrorism, posted a strongly worded condemnation on its website, dated several hours after my post. I also recall seeing, after my post, a reference in the news to a cemetery in India refusing to inter the terrorists because their acts were an offense against Islam. These are positive signs. But I stand by my underlying point — Muslims need to do A LOT more to rehabilitate their “brand” and make it clear that the “center of gravity” of the Islamic world condemns terrorist activity, regardless of the victim. The data are in. More than 99 percent of Muslims have nothing to do with terrorism. The mote is in your eye, Kirk. You are the one who needs some education about what’s going on in the Muslim world. The fact that you would insist that its Muslim’s responsibility to disabuse you is beyond arrogant. McDaddyo, thank you for challenging my preconceptions. I’m reviewing my original post in light of some web research that I should have performed before writing it. I will make a new post within the next few days, as I want to consider what I say carefully. Suffice it to say for now that I significantly overstated my case regarding the record of Islamic groups condemning terrorism. Thanks Kirk. Admitting you may have overstated tells me you’re not only smart, but confident–a good combination. The above-mentioned new post is here. There’s something missing here. Where is McDaddyo’s condemnation of terrorism in the name of Islam? Where has he (she?) posted such condemnation? When did this condemnation begin? What sort of response has McDaddyo’s condemantion met with? Where can we verify McDaddyo’s claims? was hoping to start my own blog in the near future. Anyhow, if you hazve any recommendations or techniques foor new blog owners please share. are going to a famous blogger when you are not already. Cheers!